✴A prior of San Claudio was documented in 1188. ✴In 1212, Bishop Egidio gave the complex to the Crociferi and authorised the construction of a church, a bridge and a hospital. This probably referred to a rebuilding of an existing church and also an existing bridge. I think that this bridge was probably documented in the 10th century, when it crossed a branch of the Topino that lay between the later site of San Claudio and the Isola Bella. The remains of it were recently unearthed at the junction of what are now the Via di San Giovanni dell’ Acqua and the Via Isola Bella/ Via Giovanni Pascoli (i.e to the right of the complex). It probably subsequently became known as the Ponte di San Claudio. According to Mario Sensi (referenced below, at p. 263), Pope Gregory IX gave the church and hospital on this site to a community of Poor Clares from Carpello, outside Foligno. In 1514, two sisters moved here from Santa Lucia in order to reform the community. The nunnery was suppressed in 1862. The church is now a garage and the nunnery has been converted into apartments. Part of its facade of red and white stones survives, complete with its lovely portal, which probably date to the 13th century. White marble blocks of Roman origin incorporated into the facade. Vestiges of the side of the church and the cloister can be seen from the inner courtyard at number 40. ✴St Helen holding the True Cross, with smaller figures of SS Margaret and an unknown female saint to the left and the kneeling St Jerome below. This fragment of a head of St Catherine of Alexandria probably came from San Claudio. This detached fresco is attributed to to Giovanni di Corraduccio Mazzaforte. 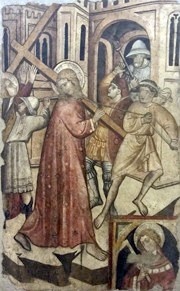 This detached fresco is also attributed to Giovanni di Corraduccio Mazzaforte. The Pinacoteca includes it among those from San Giovanni Decollato, but the presence of an image of St Claudius (with a set square) in the lower right-hand corner suggests (at least to me) that it came from San Claudio. This detached fresco seems to depict an account in the ‘Dialogues’ of Pope Gregory I, in which the young Benedict was sustained as a hermit at Subiaco by a monk called Romanus: in this picture, Romanus is bringing him water. The fresco is attributed to Giovanni Battista di Domenico de Rise (or de Riso). 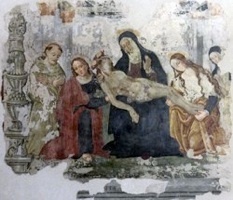 This dated fresco of the Pieta with the Virgin and SS Francis, John the Evangelist and Clare is from the nunnery.